Google's Allo is not just a WhatsApp clone but offers a lot of interesting features. This app also gives more secure control over the communication. Let's take a look at some of it's features. The app offers messaging feature similar to WhatsApp. However it has plenty of improvements compared to other messengers. For example, Allo let's you schedule the notification and message expiry time. So once you send some specific message it will automatically expire after that time. And you can't even get those messages in archive. You can also send messages in protect mode called - Incognito. Just like browser this mode will allow you to send secure messages. And no history and IP will be registered while you're sending the messages. The messages sent in between the two parties is always encrypted. So this sort of messaging protection may invite government issues. But that part will be tackled in future by this app it seems as there is no official statement on this. Google's Allo taps into your contact list and checks the users who have Allo installed. It then shows you the list of people you can send Allo messages. Like WhatsApp, it also ties your SIM with the account. This makes it easy for you to switch device without having to worry about contact portability. It allows you to send normal messages which are not encrypted. Also you can send files with specific size through the message. You are also allowed to post links and for some websites it'll show the snippet of the page summary. Google has renamed messenger emoji's and backgrounds as "expressions". 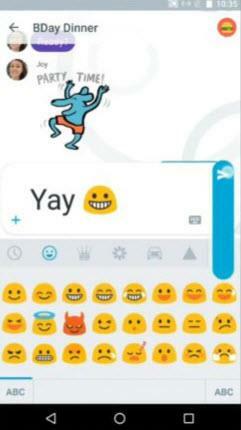 You can send the emoji of different types from the messenger. You can also decide the size of the text and emoji using the expression. This re-sizing feature is called as "Whisper Shout". This was made as an replacement to use all caps type text to get attention. Now you can use whisper shout to increase and decrease the text of the messages very easily. This is unique feature and not found in most of the other messengers. Just like WhatsApp's bot API, Google has it's own assistant that allows you to program it. You can now create various automation apps that helps you automate tasks on Whatsapp. For example, you can use the restaurant booking feature. You can also use Google search inside the messenger itself. It can find the content for you and even talk to you in limited context. There are some beta games that you can play with the bot too. This mode like browser incognito allows you to send encrypted untraceable communication messages. You can send the encrypted messages in between two users using this mode. You can also use the expiry time for the messages which will help auto delete the messages. This app makes use of Open Whisper System API. This allows the app to make use of the Signal protocol to allow incognito mode into the messaging app. This API is being used by many other messaging apps too. This protocol helps Allo to have better encryption properties. It also helps make the messages reach faster on both ends without compromising encryption. WhatsApp is using this API for some time now and they have passed on quite a lot of improvements over the years. You may find Google contributing those changes back into the Whisper system. This in turn makes the API available for other messaging apps too. There are no updates on whether this API is enhanced privately or being used as is in the first beta. But this information may get posted once the app is released. If you are enrolled in Android's Beta Tester program then you may get access to this app. You may not get invite if you don't have much testing history in your profile. Otherwise most of the old beta testers have got their hands on this app. Not much of functionality is active in the beta version as of yet, but as per sources there is lot of improvements compared to other messengers. So you're likely to have some specific set of features but with more focus on encryption. As of now, the app is available on Invite only mode. And the official page on Google Play allows pre-registration. Once the app leaves the beta period, It may be available to the registered members for some time. Then it'll be released openly in public. If you choose not to pre register then expect the app on the Google Play by September or earlier. Though there is a lot of pressure from government around the world on messenger encryption but Google is using the open source technology to power the apps. So there is less chance of government interfering with the Allo compared to WhatsApp. However the issue remains whether this app will comply to government requests or allow freedom to users for encrypted messages. Allo has lot of exciting features and we'll see more of what it has to offer once it releases in the public. Google seems to be attempting to take on Facebook by the horn. The Allo messaging app is the first step in that direction. The popularity and widespread usage of WhatsApp has been unforeseen. It needs to be seen whether Allo will be capable of overtaking the hugely popular instant messenger. It will need to work out on many fronts for that to happen. One of the biggest strengths of WhatsApp is its cross platform functionality. Google Allo will have to work on that front first. Let us see how it fares in the face of competition.